Customers tell us that this is the best pressure switch made. The Mercoid Series DA / DS is one of the world’s broadest lines of pressure switches. Whatever your application might be, it is most probable it can be fully satisfied with a D Series pressure switch. The D Series has extremely high sensitivity and great repeatability. The Mercoid Series DA / DS are equipped with two external adjustments, one for setting high pressure operating point, the other for setting low pressure operating point. Deadband, the difference between high and low set points, is adjustable over the full scale. The DS Models are equipped with a single external adjustment for setting operating point only. The deadband is fixed at a factory setting and cannot be altered in the field. For switches choose between the snap action switch, hermetically sealed snap action switch and hermetically sealed mercury switch. Wetted Materials: Brass, 403 SS, or 316 SS. Pressure Limit: Maximum pressure of the operating range. Enclosure Options: General purpose, weatherproof or explosion-proof. Repeatability: ±1% of full operating range, ±1.5% on DS-7300 models. Switch Type: SPST mercury switch, SPDT mercury switch, SPDT snap switch, or SPDT hermetically sealed snap switch. Other circuit types available. Electrical Rating: See Catalog page. Conduit Connection: General purpose: 1/2″ hole for conduit hub. Weatherproof: 1/2″ conduit hub. Explosion-proof: 3/4″ female NPT. Process Connection: General purpose and weatherproof: 1/4″ male NPT; 1/2″ male NPT on range 15S and 16S. Explosion-proof: 1/2″ male NPT and 1/4″ female NPT. Set Point Adjustment: Thumbscrew.Weight:General purpose: 4 lb (1.8 kg). Weatherproof: 6 lb (2.7 kg). Explosion-proof: 8 lb (3.5 kg). On/off indication (except hermetically sealed snap switch models). SPDT snap-action, hermetically sealed snap action or hermetically sealed mercury switch. Minimum deadband is obtainable at any point in the range. Pressure Ranges of full vacuum to 8000 psig. UL listed, CSA approved. Many models FM approved. General purpose, weatherproof or explosion-proof enclosures. Explosion-proof Enclosure (Series DAH): Suitable for Class I, Groups C and D; NEMA 7; Class II, Groups E, F, G; Class III NEMA 9 and 9A, Division 1. Add “H” to model number after DA or DS. Example: DAH-31-153-7. FM Approved: For general purpose and explosion-proof models see Agency Approvals on Specification page. Add “F” to model number after DA, DS, DAH or DSH. Examples: DAF-31-153-7 or DAHF-31-153-7. Weatherproof Enclosure (Series DAW): Add “W” to model number after DA or DS and change 1 to 3. Example: DAW-33-153-7. D is the generic designation for the pressure switch series. The next letter following the D designates the function of the switch with regard to the type of deadband and operation. DA, for example, means a D series pressure switch that has an adjustable deadband with double adjustments and is fully automatic. See page 10 for more information. 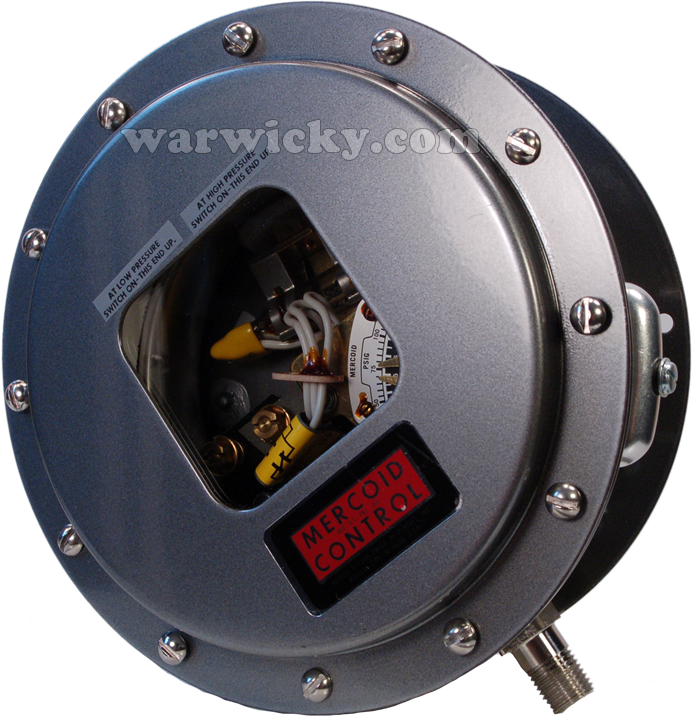 A general purpose NEMA 1 enclosure is furnished as standard on all Series D pressure switches. Weatherproof and explosion-proof housings are optionally available and designated by adding a third character to the model number. DAW, for example, indicates a DA pressure switch with a weatherproof enclosure. The D Series is available with Bourdon tubes constructed of brass, Type 403 stainless steel, and Type 316 stainless steel. Material is designated as part of the series type number with 3 corresponding to brass, 2 to 403 stainless steel, and 4 to 316 stainless steel. For example, DA-31, DA-7031, DS-7231, and DA-531 all have brass bourdon tubes. Mercoid® Series D pressure switches are available with mercury or snap-action contacts. Snap-action switch models always start with the series type number of 7. For example, DA-7031 and DS-7231 are both snap switch models. Snap switches are availale in SPDT and DPDT while the mercury switches are available in SPST, SPDT, DPDT, and DPST. The switch code designates the type of contact and follows the series type number in the overall model number. For example, DA-7031-153 is a SPDT snap switch while DA-31-153 is a SPDT mercury switch. Contact rating should also be considered when choosing the contact type. The last part of the Series D model number is the operating range number. Operation of the switch is adjustable within the limits of the shown operating range. The upper limit of the adjustable operating range is also the maximum pressure for the switch and should not be exceeded. For example, DAW-33-3-2 has range number 2, which is 0 to 30˝ Hg vacuum.